Ratina Z, Darco, Saphire, Cornet Obolensky, Toulon,... The list of the Belgian bred horses that perform on the highest level is endless. As central country in Europe, Belgium is regarded by many horse breeders, riders and dealers as the undisputed number one when it comes to horse breeding. Our Belgian bred horses are found all over the world competing in the largest shows and every hundreds of elite foals, young horses and sporthorses are sold to all corners of the world. Our three Belgian studbooks Zangersheide, BWP and SBS do their best year after year to select the best stallions and to motivate breeders to breed with high quality broodmares and the best stallions that worldwide can be found. On these pages you can find some top broodmares owned by Belgian breeders. The overview shows the different mares with pictures and more information, on the pages Breeding Program you can find the foals that will be expected next. Horse owners and breeders who want to start with the highest quality can find some very good foals for sale on the Sales Page. Obviously in these pages are not only mares with primeval old Belgian mother lines. The location of Belgium in Europe makes it possible to create the perfect mix in breeding. This mix is the strength and advantage of the Belgian breeding. Remember how Mr. Melchior (founder of Studbook Zangersheide) went to Hannover several decades ago to buy the best mares over there and later cross them with the French stallion Almé Z. This cross-outs mares were later mated with the stallion Ramiro Z. 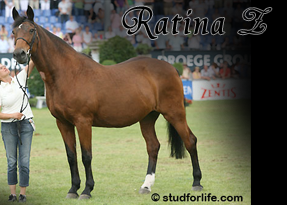 Out of this orginal mix Ratina Z was born, Ratina Z is still known as the best mare ever! Without such an international mix, we would miss a large number of contemporary horses. For example the relevance of the moment, Mylord Carthago; a typical cross between german (Carthago Z) and french (Jalisco B) blood. Or what about the Holsteiner Sieger 2008: Diarado (Diamant de Semilly - Corrado I). It may be clear that these pages contain not only the typical Belgian horses, but simply the best horses Belgium has to offer! You will see some pure bred Holsteiner and Hanoveranian mares such as the full sister to Casiro (Cassini I - Landgraf I) and the mare Cassina (Cassini I - Cor de la Bruyere). We also offer products from various interesting mixes of European studbooks like the mare Jaretelle Z. This is a daughter by Jus de Fontaines with the famous Caletto I mare Roofs. Roofs is without any doubt one of the best mares in the world, under Jan Tops she competed at the highest possible level! From Jaretelle Z we will expect 3 foals by embryo transplantation in 2010. The first of the French-bred stallion stallion Zandor Z (Zeus), the second will be a foal by the stallion Cornet Obolensky (Clinton  Heartbreaker), a from origin Belgian stallion. The third will be a foal by the pure bred Holsteiner stallion Clinton I (Carolus). Another mare on this website is the mare d'Ushuaia d'Arsouilles. This "typically Belgian" mare is none other than the full sister to our Belgian proud Vigo d'Arsouilles who was very successful at the European Championship under Philippe Lejeune. The mare jumped herself in a puissance show over a wall of 2m10 on a show in Czech. Vigo dArsouilles From this interesting mare you can purchase embryos. You choose your stallion, we create the embryo for you and send you the foal when he is born. Very easy and a very good service, isnt it? You're looking for a quality broodmare, an elite foal or perhaps a pregnancy by a stallion of your choice? Dont hesitate to contact us via mail or by telephone!